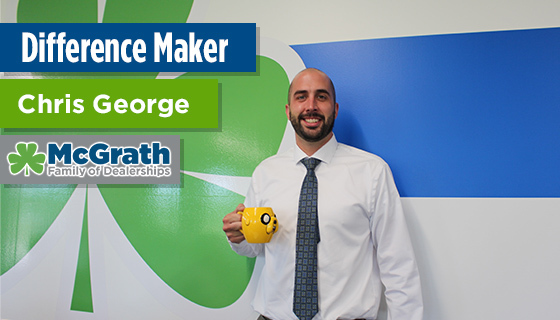 Congrats on earning the McGrath Auto April 2016 Difference Maker Award, Chris! When a family from Columbus, Ohio had to leave their car at the dealership overnight, Chris — without hesitation — drove the family to the airport to get a rental. Hobbies: I like fishing, kayaking, going to sporting events and being outdoors. What do you like best about working at McGrath? : The customers. It’s great meeting new people, building relationships with them and their families and having them put their trust in me. Do you have any hidden talents? : It’s not a “talent,” but I have two different colored eyes. What is your ideal vacation? : Anywhere I can disappear to for a while. Congrats, Chris! McGrath Auto appreciates all of your hard work and dedication! Visit one of our several service centers and new & used car dealership locations in Cedar Rapids, Coralville / Iowa City, Dubuque and Davenport! Would you like to join a team that goes the extra mile to help others? Check out our employment opportunities!